When you think of life in a small town atmosphere, what comes to mind? Family picnics on a hot Sunday afternoon down at the lake? Marching in a Fourth of July parade? Catching lightning bugs in a jar at dusk? All those things might happen and probably do, but what if there is another darker side to the town's character that's been hidden from view? And what if you should be the unfortunate one who's thrust into the dangerous position of uncovering these truths? Mona Murphy returns to Copper Springs to attend her grandfather's memorial service. His passing appeared ordinary enough--the official report stated he'd tripped and fallen down the staircase. Yet Preston Hitchcock, the insurance agent who'd sold a half million dollar policy to Mona's grandfather days before the old man died isn't convinced, especially when bloody towels are discovered in the backyard. And that's only the beginning. Who is the hit-and-run driver who attempts to run Mona down? Why is her old boyfriend more ardent for her affections now than ever before? And why is Mona helpless to guard her heart from the devastating influence of Preston's practiced lady-killer smiles? Secrets Mona never knew existed in Copper Springs become exposed. But none is so revealing as the one she fights to hide -- and the very one that might save her life. 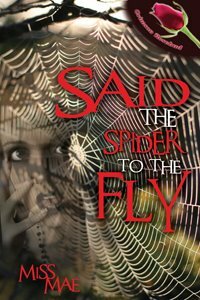 My new book, "Said the Spider to the Fly" is a Crimson Rosebud from The Wild Rose Press, meaning it's a romantic suspense. The release date has just been announced...The digital ebook will be out on February 4, 2009 and the print version follows on March 20, 2009! Boy, I can't wait! I have an excerpt and trailer at my site http://www.missmaesite.com which is sure to whet your appetite even more. While there, look around at the other offerings. A free read, titled "Dove Island" will be out soon and I've sent in a new manuscript that, hopefully, will be contracted as well! As the Pure Southern Genteel author, I promise a good storyline that's mild enough on "graphics" that you won't squirm with discomfort at allowing your daughter -- or grandmother -- to read my books! So, as my signature says, "Love to read about suspense? Love to read about mystery? Love to read about love? Get caught in the 'web' of Miss Mae's books!"